The inspiration for this painting came to me, as it often does, from observing the beauty of the natural world. I was watching a nature documentary about the extremes of nature- everything from extreme cold to extreme heat, the deepest points of the ocean to the highest peaks of mountains. Yet what truly fascinated me was the menacing beauty of volcanoes. The swirling waves of red, yellow, orange, pink, and blue in my painting were inspired by the fiery viscous flows of lava. The way the red liquid fire flows and hardens into the dark volcanic rock inspired me to paint this piece using long, smooth brush strokes to create the effect of motion. I love using bright colours in my paintings and the glowing reds of lava gave me the little spark that I needed to create a piece that was passionate, calming and intriguing all at the same time. If you’ve ever been on vacation anywhere near a desert or had the chance to see one in real life, then you know what I’m talking about when I say that there is a sort of threatening beauty in the merciless heat and seemingly endless miles of smooth, rolling sand dunes of a desert. Having lived in Israel, I’ve seen and had the chance to experience and witness the beauty of nature deserts have a special place in my heart. Like many aspects of nature, deserts are captivating and beautiful, but also dangerous and merciless. I wanted to create a similar effect with this painting, to recreate the feeling of serenity and yet make sure that the piece also portrayed the fierce beauty of a desert landscape, or the intensity of flowing lava. To try and achieve this I decided to use oil paints, as their richness will not only add vibrancy and character to the piece but will also create an interesting and appealing texture that I would not be able to achieve with acrylic paints. The reds and yellows contrast with the darker tones to create a captivating dance between fire and ice so to speak (in the more muted tones of blue, purple and black). The dark orb, the Blue Moon, in the painting seems to be almost engulfed by the moving, swirling fire and lava coloured waves. Though overall the concept is abstract, I wanted the final product to have a duality to it; to be gentle and serene while at the same time passionate and exciting. My wish as an artist is so that this piece would resonate with you, in the same way that the beauty of nature and the world around us has inspired me. 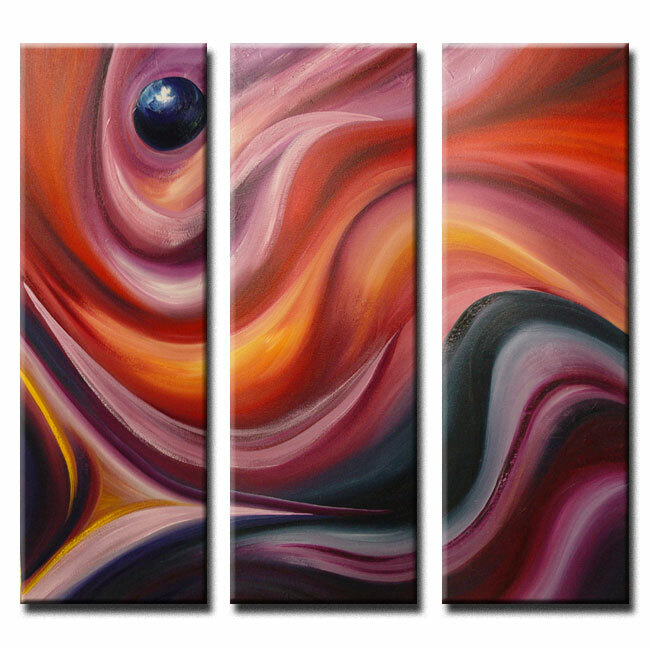 May the rich and intense colours of the painting add a pop of colour, a touch of intrigue and a dash of passion to whatever space you decided to hang it in, whether that be an office, living room or bedroom I am sure that it will be an excellent addition to any room and fill it with warmth, beauty, energy and harmony.